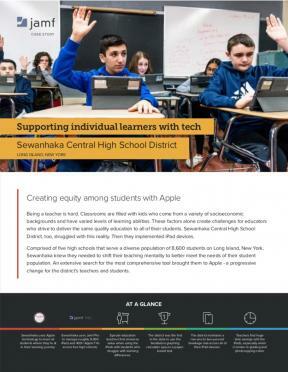 After an extensive decision analysis, which evaluated tech from Google, Microsoft and Apple, the Sewanhaka Central High School District said their nearly 9,000 iPad devices not only level the socioeconomic playing field between students, but they also serve as a huge equalizer for students with learning differences. Sewanhaka was also the first district in New York to use the free GeoGebra graphing calculator app on a paper-based test - another way to create equity among students. Robert Pontecorvo, coordinator of mathematics, Sewanhaka Central High School District, said in one of the district’s schools, 300 kids didn’t have graphing calculators for a previous test - an unacceptable disparity between students. Read the full story to learn how Sewanhaka gives every student the opportunity to be their best with Apple technology.